What Does the Lordship of Christ Mean? Have you ever heard about the “Lordship of Christ?” What does that mean? Does this apply to Jesus’ followers? The old English word “lord” without the capital “l” is the same as our use of the word sir or mister today. It is a sign of respect. We still use this word when talking about the “landlord” which is borrowed from the Old English when there were lords or land shires, barons or earls over the land that they ruled and owned. In the United Kingdom, he was known as the master or ruler, a feudal superior. They were the lords of the land or property, so to speak. It was typically a man of noble rank or high office and is there anyone who is of higher and more noble of rank than the Lord Jesus Christ? No, there is not. 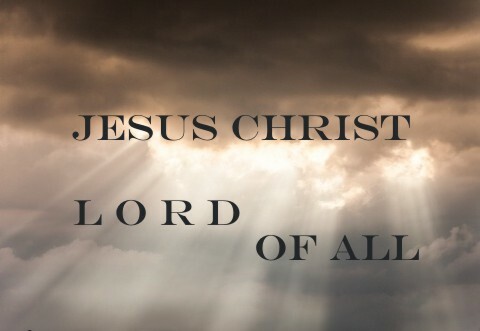 He is called the Lord of lords and King of kings (Rev 19:16). This is not only His title but His job description as ruler of all the universe. Jesus is Lord of all and someday, perhaps soon, God says that “every knee shall bow to me, and every tongue shall confess to God” (Rom 14:11) and “Therefore God has highly exalted him and bestowed on him the name that is above every name, so that at the name of Jesus every knee should bow, in heaven and on earth and under the earth, and every tongue confess that Jesus Christ is Lord, to the glory of God the Father” (Phil 2:9-11). For those who have repented and trusted in the Lord, He is their Lord today and they bow the knee willingly, in submission to Him. For others who reject Him as Lord, they will still bow the knee, either in an overwhelming sense in knowing Who He really is or by the force of God because “every knee” will bow, of that we can be certain. For those who willingly bend the knee and bow today it will go exceedingly better on the Day of Judgment than for those who refuse to do so (Rev 20:11-15). I have heard some say that if He is not Lord of all He is not Lord at all. There is some truth to that statement. James commands believers to submit their lives to God and by doing so we can resist the Devil. He writes “Submit yourselves therefore to God. Resist the devil, and he will flee from you” (James 4:7). The converse would seem to be true; if you don’t submit to God then you cannot successfully resist the devil and he will not flee from you because James put the word “therefore” in this sentence as if to say if you submit yourself to God, you can therefore resist the devil. What is the “therefore” there for? It is an enabling word. It is like saying if you do this, then you can do that, therefore submission to God is required in order to resist the Devil and by doing so, he will flee from you. James writes that “friendship with the world is enmity with God? Therefore whoever wishes to be a friend of the world makes himself an enemy of God” (James 4:4b). You cannot be friends with the world and be submitting to God at the same time. If you have embraced the world and have a lust for the things of the world (a friendship with) then you are at enmity (or at war) with God. That’s not going to end well. Paul gives us a definition of those who are the Lords in Colossians 1:15-17 writing that it is Jesus “Who is the image of the invisible God, the firstborn of every creature: For by him were all things created, that are in heaven, and that are in earth, visible and invisible, whether they be thrones, or dominions, or principalities, or powers: all things were created by him, and for him: And he is before all things, and by him all things consist.” Now if that’s not a definition of Lordship, I don’t know what is. That’s clear when Paul writes “We give thanks to God and the Father of our Lord Jesus Christ, praying always for you” (Col 1:3). That’s why Paul told the church at Corinth to “Examine yourselves, to see whether you are in the faith. Test yourselves. Or do you not realize this about yourselves, that Jesus Christ is in you?—unless indeed you fail to meet the test” (2 Cor 13:5). He who you serve is your lord. If you are serving sin, then the Devil is your lord but if you are serving Christ, then He is your Lord. Paul didn’t want the Roman Christians to be fooled which is why he wrote “Do you not know that if you present yourselves to anyone as obedient slaves, you are slaves of the one whom you obey, either of sin, which leads to death, or of obedience, which leads to righteousness” (Rom 6:16)? Jesus said that “everyone who sins is a slave to sin” (John 8:34). Paul goes on to say “When you were slaves to sin, you were free from the control of righteousness” (Rom 6:20) “Therefore, I urge you, brothers and sisters, in view of God’s mercy, to offer your bodies as a living sacrifice, holy and pleasing to God–this is your true and proper worship” (Rom 12:10). If you are presenting your own body…your complete life to God, you will lay it down on the altar before God and make yourself a living sacrifice. That proves lordship. Too often this living sacrifice crawls off the altar. Peter reminds us that “people are slaves to whatever has mastered them” (2 Pet 2:19). If you have repented of your sins, confessed them to God, and then placed your trust in Christ, then He is your Lord and He has all rights and authority to have lordship over you. If not, then you are still in your sins and you will die in them (John 8:24). If you will die in your sins then you will spend all eternity in hell paying for them and since no one can pay for their own sins, the ongoing payment will never end. I beg you today to make this your day of salvation (2 Cor 6:2) because tomorrow may be too late (Rev 20:11-15). Here is the way to grow in grace. Find a Bible-believing church, attend Sunday school, hear the sermons, attend Sun and/or Weds night Bible study, fast and pray, stay in the Word at least twice a day. Talk to your pastor about ways to grown. Too many people think they can serve God with their lips only, never making Him the Lord of their lives. As you mentioned in your article, God has the right to be Lord over us. We could never have a more loving, powerful, or just Lord than Him. God bless you, brother. I always love hearing from you Robert and miss communicating to you more often. You are always so encouraging. As for me, I fall very short at times but that’s why God’ grace is so amazing and He is the God of the second chance, the third chance, the ….you get the idea. May God richly bless you Robert.